Genuine OEM Okidata Image Drum, Yellow, 15,000 page yield. Type C8. Okidata part number: 43381701. Image Drum compatible with Okidata C5500, C5650, C5800. I have been using the drums from ink technology for over four years and thousands of pages printed. Great Products. The drum works just fine, images are great professional quality. Met all expectations. 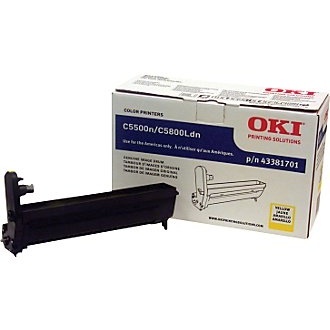 Have been using Oki 5500 color printer for 7 years. The color is as good as when new and it is very fast compared to similar products claiming the same print speeds. I have been using InkTechnologies aftermarket toner and have had no issues on the Okidata. Overall it is a very inexpensive printer to run. Good quality. Would recommend to others. Condiser buying the comparable rather than the namebrand products to save. The OEM Okidata image drums are specific to my printers. They work great! Ink Technologies' pricing can't be beat! And their order processing and shipping is quick and efficient! Don't buy anywhere else!